I have unlocked all the arenas. 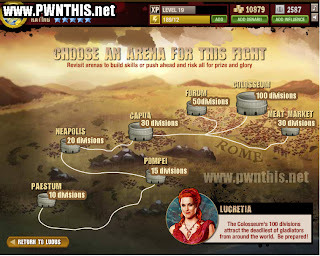 Just a quick heads up, the Coloseum has 100 divisions, the Forum has 50 divisions, the Meat Market and Capua has 30 divisions. 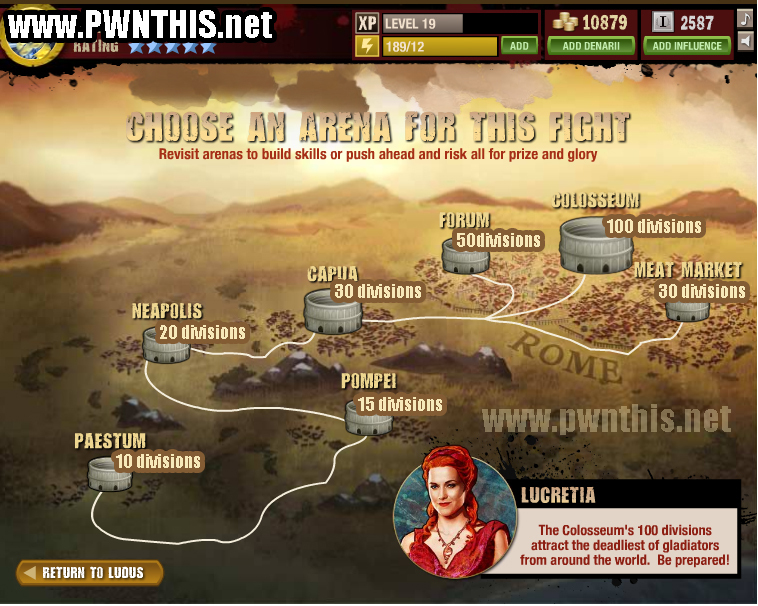 I think it will take a couple of hours to complete the Coloseum 100 divisions even with energy hack, speedhack and 100% win and botting it. Not gonna try as there seems to be more pop ups in the game which screws up my botting. Will be releasing the cheats that I have been using tomorrow. Stay tune. And go watch the show if you have not! It's like 300 (the movie) but 1000000 times better :p And you have to be above 18 to watch it due to the gore and several other vices. The storyline is awesome though. Full of schemes and backstabbing. w00t.